Madeline Finn doesn't like to read. And reading aloud is even worse. She just hates it. Many times she can't figure out the words in the page, or they just get stuck in her mouth when she tries to say them. Madeline would like to earn a star at school for being a star-reader, but she only gets keep-on-trying stickers, plus some giggles from her classmates when she makes a mistake. 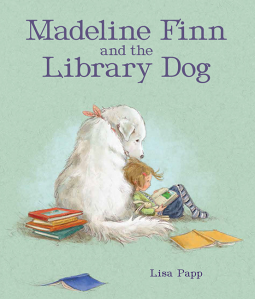 One day when she visits the library she is offered to read a book to Bonnie, a big, white, flurry dog. Bonnie is a great listener. She doesn't giggle, she is patient when Madeline Finn's words come out all wrong, and she doesn't mind about slow reading. After many Saturdays reading to Bonnie, Madeline Finn is ready to try at school. It's difficult at the beginning, but she takes a deep breath and just pretends to be reading to Bonnie. Beautiful, beautiful, book about being patient and keep on trying when we fail in doing something. Madeline's dislike for reading is nothing more than her anger for not being able to do it right. She is being too hard on herself, and that only make things more difficult. But Madeline learns from Bonnie to be patient and forgiving. The illustrations are marvelous. There is something so calm and vivid at the same time in them. Highly recommended.